As innkeepers, we are usually so busy running the inn and maintaining the property we don’t have a chance to go and just explore ourselves. However, when we get a good tip from our guests, we love to take advantage of the opportunity- especially when it’s a known winner. And sometimes it’s so good we even write about it – like now! When it’s a beautiful day and you just want to take a leisurely drive and enjoy a little bit of Wisconsin, jump on Highway 51 North to Highway 19 West through Waunakee. As you are passing through Waunakee, you’ll want to stop at The Red Barn Company Store on Main Street. It has a wonderfully eclectic collection of household goods, vintage keepsakes, signage, lighting, and unusual collectibles. You’ll be sure to find something you just can’t live without and didn’t even know it before you got there! Head to Highway 12 North and enjoy the beautiful countryside and connect to 78 North to head into Prairie Du Sac. The Blue Spoon Café is a stop you won’t want to miss. This beautiful little oasis is right on the main street of town and is unmatched for the quality of food and ambiance. There are 3 cascading terraces offering outdoor dining with a stunning view of the Wisconsin River. We ordered the Grilled Tuna Tapenade and the Prosciutto Euro Sandwiches with a side of Quinoa Salad with Lentils and a Couscous Salad with Tomato Basil and the Vegetable Beef Soup and all of it was amazing. The burst of different flavors with the infusion of herbs were fantastic. But it’s a tough call whether to eat there or to get a take out picnic for where we will take you next, so we suggest you do both! Just make sure you bring a cooler with ice so you’re prepared either way. 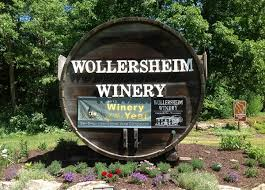 After you’ve gotten a nice little picnic to go, continue on Highway 78 to Highway 60 and stop at the Wollersheim Winery & Distillery. 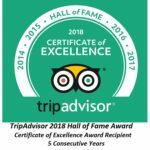 We made a point to visit the Winery last winter when things slowed down a bit for us – we sell their wine at the inn after all, but we found that the pairing of the Blue Spoon picnic and a trip to the winery were a great idea. Not only is this a first class winery, but they also have a distillery that recently opened and the history alone is worth the visit. Having spent 30 years in California, we know a couple of things about wine and honestly weren’t too sure about a winery in Wisconsin – after all this is the Dairy State for goodness sake! But we were totally impressed with everything – from the mixture of old and new architecture, the thoughtful design and presentation, and the wonderfully unique and different wines they offer – including Ice Wine! And the story of how it all began to where it is now is fascinating. So after you’ve enjoyed all the flights (tastings) you can handle, pick your favorite wine and enjoy it with your picnic basket on their beautiful terrace with tables and chairs and soak in the beauty of the landscaping around you.